Mark Lawrence and guest co-host John Shipman host Dr. Lenaire Ahlum, Susquehanna Valley Community Education Project, and (her sister) Lt. Col. Malia Pearson, US Army Reserves/US Army Corp of Engineers, on the mission and progress of creating a Sunbury based community college. Q: Why is education in Pennsylvania important to you? A: As a leader in education, I recognize that the future of our economy and workforce are dependent upon a highly trained and qualified employee. I support funding for Community Colleges and the expansion of existing, and development of new, career pathways for students. Q: What knowledge, background or skills do you bring to the Community College Caucus? A: I am a former professor having spent 14 years in the classroom. In addition, I have been the Chairman of the House Democratic Education Committee for the past 18 years, as well as a member of the Board of Trustees for the Community College of Philadelphia and have been actively involved in the issues facing our Community Colleges. Q: How would you describe the impact of community colleges in your district and statewide? A: Community colleges provide young people with a foundation on which to build successful lives. It affords them the opportunity to better themselves and to reach their dreams. Q: What motivates you to improve access to education in Pennsylvania? A: If we want to keep up with the ever-changing workforce, Pennsylvania needs to prioritize increasing attainment of education certificates and associates degrees for our working families. Community Colleges help achieve that by providing the most affordable options for students to obtain a degree. Q: What do you believe are the biggest challenges facing community colleges in the Commonwealth? A: One issue facing community colleges is keeping the students in school until graduation. The primary challenge is remedial students who struggle at the beginning of their college career, and shortly give up and drop out before completing their degree. We need to close the gap! Students need to come ready to learn. Across the board, the price of attending college has risen dramatically in recent years. While Community college has been the most affordable option, they are no longer the exception to this trend. A: Investing in higher education, and in community colleges in particular, is one of the best investments a state can make. Pennsylvania needs to improve its investment in its community colleges to ensure they remain an accessible and affordable pathway to higher education for students. 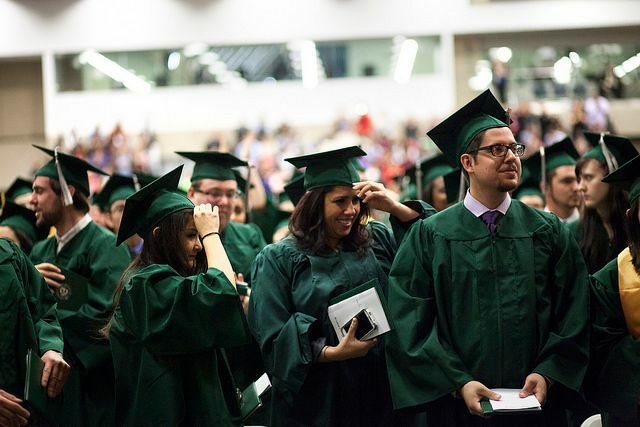 WASHINGTON, Jan. 28, 2019 /PRNewswire/ — Community colleges provide a pathway to educational and career success for millions of students. That pathway is recognized as a key component to increasing the number of skilled workers in the United States. The American Association of Community Colleges (AACC) has partnered with the U.S. Department of Labor to launch a major initiative to dramatically increase the number of apprentices entering the workforce. Adult learners bring incredible diversity into classrooms across America. Their variety of life-experiences and perspectives, their determination to succeed, and their work-ethic make them model students in many ways. However, adult learners also face special challenges. They need support dealing with new technology, financial issues, and intergenerational classroom dynamics. Adult learners make up a large part of the student body at community colleges, and so whether they succeed or fail will impact these schools’ enrollment goals and financial targets. Community colleges and non-traditional students succeed together when schools understand how best to serve this important demographic. A study from the College Research Board shows that community colleges are a key resource for adults returning to school. In 2011-12 about 44% of first and second year undergraduate students in the public two-year sector were older than twenty-five. This is more than double the percentage of older students in the public four-year sector, which served only 20% of students over twenty-five. The percentage of full-time adult students in the public four-year sector was even lower, only 10%, a third of the number of full-time adult learners in the public two-year sector. Although community colleges are not the only institution serving adult learners, they are often the first choice for returning students looking to pick up new job skills or obtain a degree. Both affordable and friendly to working students, community colleges appeal to returning adult learners. In turn, adult learners provide a large part of the tuition dollars that community colleges need to keep functioning each year. Returning adult learners often have had some previous college experience. The difficulty is how to best fashion it to support their new academic goals. Obtaining decades old transcripts can be difficult, and even once the official copies are delivered the courses may not be up to the institution’s transfer standards. However, adult learners are highly motivated and returning to school with clear objectives in mind. Whatever missteps they’ve had in the past, with the right support they can flourish in an academic setting. Admissions officers should encourage adult students to request old transcripts that could reduce the credit load they have to take to complete a degree. Even just helping adult learners find the right number to call at their previous institution can make the process easier. The credit transfer process should also be as simple as possible. Otherwise, adult learners lose time and money re-taking courses they’ve already had. Adult students are likely to be financially independent from their parents, and so assuming the entire financial burden of college. NPR reports than half are financially independent, and 1 in 4 have their own children to support. Because of this, they may need more vertical support from advisors, teachers, and financial aid counselors, as well as additional services like technology classes or childcare assistance. How well a community college can provide this kind of support will have a measurable impact on whether these students thrive. Of course, colleges are financially limited in what they can do. Yet, an adult student without a ride to school, or childcare, or a home computer is bound to struggle with completing assignments. If your institution can proactively work with students to confront these challenges, they are more likely to matriculate. A longitudinal study of community colleges in Washington state showed that adult students enrolled in community colleges were more likely to earn a credential or complete at least 45 credits when they received financial aid. However, the same study showed that less than a majority of low-skill adult learners received this kind of support. This meant more returned to the workforce without the additional earning power a community college could provide. Other adult learners might be returning to school to retrain for a new job after years in the workforce, when they’ve suddenly lost a long-term job. With their own retirement looming, it can be difficult to know how to factor in student loans or pay for courses. Having a financial aid staff that understands the special challenges that older students face, from paying for courses to planning for retirement, is an important part of supporting mature students. Adult learners might be anxious about participating in study groups or other peer learning opportunities. Joining a classroom with much younger students, especially those that seem adept at the kinds of academic tasks that adult learners find intimidating, can be very difficult. In fact, fear of humiliation can keep adult learners from forming invaluable student-to-student relationships. However, teachers can help draw adult learners into the classroom experience. Their life-experience enriches classroom discussion and their mature perspective and determination to succeed can motivate younger students. With the right encouragement, older and younger students can develop mutually beneficial relationships. Adult learners are a critical part of the community college student body. To continue to meet enrollment goals, community colleges must be appealing to adult learners. Doing this means showing that the school understands the kind of support these students need. Every interaction with admissions staff and financial aid officers should leave returning adult learners feeling satisfied that the school can help them overcome the unique kinds of challenges they face. However, the college needs to communicate this message to prospective adult students long before they arrive on campus for a visit. We believe the best way to do this is by providing clear and informative content that engages prospective students and the community at large. This is the best way to attract adult students in today’s competitive college marketplace. If you want to know how your college can do this economically and effectively, request a demonstration of our services today. THANK YOU FOR A FANTASTIC EVENT!!! Vision– Providing hope and direction to our community through education. Mission Statement– The Susquehanna Valley community college promotes student success and lifelong learning through accessible, empowering, and innovative programs and partnerships. Connected Nation believes that states, communities, families, and individuals can realize great economic and social advantages when we accelerate broadband availability in underserved areas and increase broadband use in all areas, rural and urban, alike. Today, Governor Tom Wolf visited Lehigh Carbon Community College (LCCC) to see the hands-on training provided by the commercial driving program and talk with students and local employers about the growth of the commercial truck driving industry in the Lehigh Valley.“The commercial trucking industry continues to expand in the Lehigh Valley and that is creating many good-paying family sustaining jobs in this region,” said Governor Wolf. “Not every student wants to go to a four-year college or university, but workers need advanced skills for most in-demand jobs. By bringing together LCCC, employers and the community, training programs like this are creating a pipeline to prepare people for the jobs companies need to fill.”LCCC’s commercial driver’s license (CDL) program trained 225 people last year. Instruction is provided in both a classroom and using a fleet of LCCC trucks or vehicles provided by businesses. In addition, CDL safety training is conducted for companies such as Wegmans and Amazon.The CDL Class A course is a 172-hour course that prepares students for the CDL Class A exam to drive tractor trailers. The Class B course is 80 hours and prepares students for the exam to drive school buses, dump trucks or delivery vehicles.“Lehigh Carbon Community College works closely with area employers to ensure we are meeting their training needs and preparing the workforce for jobs in our area,” said Dr. Ann Bieber, president of Lehigh Carbon Community College. “The visit from Governor Wolf gives us the opportunity to showcase two of our programs – CDL truck driving training and manufacturing – and how they directly relate to the needs of our region, positively impacting economic development.”Pennsylvania has approximately 80,000 tractor trailer and heavy truck drivers, and nearly 2,300 annual job openings are expected through 2024. In Lehigh Valley and Northampton counties the truck transportation industry has seen tremendous growth with employment increasing 56 percent between 2011 and 2016. Entry-level wages in the region typically start around $32,000 and wages of experienced drivers are nearly $54,000.After the tour the governor met with LCCC leaders, commercial driving students and local transportation company managers to discuss the growth of the commercial driving industry in the region and the collaboration among the partners.Lehigh Carbon Community College was founded in 1966 and served 9,740 credit and 4,600 noncredit students in 2015-16 from Lehigh, Carbon, Schuylkill and surrounding counties and offered more than 90 programs of study in business, education, communication, computer science, technology, humanities, health care, science, engineering and math. They’ve acquired new collar skills through community colleges…read the full article here. At IBM, we are working hard to make today’s tech workforce more diversity and inclusive. That diversity is reflected in the ways that many of our professionals have built the skills required for success in these exciting fields. In fact, around 15% of the new employees IBM hires in the US each year have less than a traditional bachelor’s degree. These IBMers’ roles aren’t white collar or blue collar jobs, they’re New Collar jobs – where skills matter more than degrees. 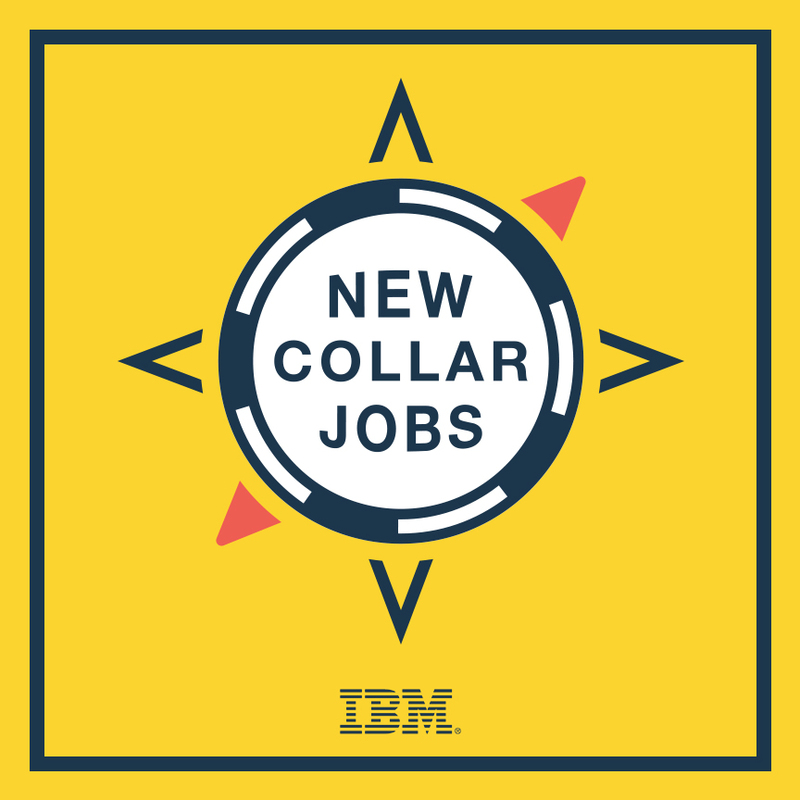 From coding camps and P-TECH (which IBM pioneered) to community colleges, new collar IBMers have built in-demand skills that qualify them for jobs in fast growing fields that offer significant upward mobility. Read the full article here. The education secretary argued for a renewed focus on apprenticeship programs. Secretary of Education Betsy DeVos on Tuesday called for a “major shift” in higher education – one that prioritizes programs like apprenticeships over four-year college degrees. “For decades now, we have given the subtle, or not so subtle, message that the only path for a successful life is a four-year degree,” DeVos said at the Wall Street Journal CEO Council conference in Washington. “There is really no traditional student anymore,” she said, underscoring the small percentage of high school graduates who enroll full time in a four-year college and graduate within four years. DeVos said educators should be “honoring” the various pathways to careers and that they should increase the importance and focus on workforce training programs like apprenticeships. DeVos pushed the business leaders at the conference to engage the education community around them, including by building partnerships with community colleges and other local workforce training institutions. 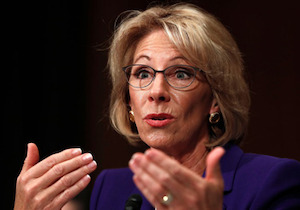 Her remarks echo those made Monday during a meeting of the White House Task Force on Apprenticeship Expansion, where she similarly called for the education community to quit pushing students to earn a four-year degree and instead renew a focus on apprenticeship programs. The administration’s focus on apprenticeships and other workforce training programs is an effort, not unlike those of the previous administration, to help fill roughly 6 million job openings in the U.S. and put a dent in the skills gap. Indeed, 30 million good-paying jobs are available in the U.S. for those without four-year degrees, according to a new report by Georgetown University‘s Center on Education and the Workforce. During her remarks, DeVos also addressed rumors about her potential resignation that gained traction last week after reports posted online appeared to misrepresent part of a profile of DeVos published by Politico. DeVos said she is “absolutely not” resigning. The community college presidents cited the following barriers that are especially hard on rural community colleges: 1) Institutional accreditation barriers, 2) accreditation barriers for dual enrollment students, 3) lack of Pell grants for short-term job specific training programs, 4) barriers to classes geared toward gainful employment, and 5) student access and transportation barriers. “Another problem is correctly defining the term rural,” said Blankenship. “It is currently defined as a municipality with the population that does not exceed 20,000. The RCCA (Rural Community College Association) is lobbying to have that number raised to 35,000 in the current Farm Bill because many municipalities of this size serve the rural area around them and would account for 85% of the rural community colleges. Doing so would increase their eligibility for the United States Department of Agriculture Community Facilities Grant and Loan program. The event took place at Luzerne County Community College and included the release of the ReadyNation report, “Community Colleges Are the Sturdiest Bridge to a Successful Workforce.” Attendees of the event included Congressman Lou Barletta, President of Luzerne County Community College Thomas P. Leary, President and CEO of the Greater Wilkes-Barre Chamber of Commerce Wico Van Genderen, Advanced Metals Machining Human Resources Manager George Rando, and state Senator John Yudichak. For the past two weeks, the Administration has been working extensively on vocational education, infrastructure, and technology. The President declared he would push for increased rural internet access in his proposed infrastructure plan. Josh Sanburn / Watertown, S.D. The problems are particularly acute in places that stand to benefit most. In Pennsylvania, which has a need for skilled workers after losing tens of thousands of blue collar manufacturing jobs, community-college graduation rates are some of the lowest in the country. Bucks County Community College in Newtown, Pa., graduated 12.3% of its students in 2014, according to the U.S. Department of Education. At Community College of Philadelphia, the figure was just 9.8%. The culprits are many. Pennsylvania’s 14 community colleges are run as stand-alone shops, without a state-level office to coordinate them. Unlike South Dakota’s LATI, which shapes its coursework around the needs of employers and relies on their donations of heavy-duty machinery for its classrooms, Keystone State schools have been left largely on their own. “The chronic lack of resources makes it more difficult for community colleges to respond to the workforce needs than in a state where they’re better supported,” says Kate Shaw, executive director of the Philadelphia-based education nonprofit Research for Action. As more college graduates lament high student loan debt and parents look to lessen the cost of higher education, public perception is shifting in favor of community colleges. New survey data released Thursday by a higher education think tank, New America, illustrates how young adults feel about community colleges regarding importance to the workforce, value and ability to prepare students for success. Overall, Americans hold public two-year colleges in high regard, according to the survey data. Hannah Ticherich, 19, just finished her first year at Lorain County Community College after graduating from Berea-Midpark High School. Thank you to Jerry Spegman, Community Coach with County Health Rankings. County Health Rankings publishes data relevant to health factors and health outcomes for every county in the United States. The Robert Wood Johnson Foundation funds the research to assist policy makers with 30 measures of their regional health. Jerry presented the annual county health rankings for Pennsylvania and honed in on counties that would be serviced by the Susquehanna Valley Community College. Research the health of counties at this website – County Health Rankings and Roadmaps website or at the Robert Wood Johnson Foundation website. Dr. Trowbridge is visiting scholar at the Nexus Research and Policy Center. “We have to use community colleges to train people for what jobs are available,” he said. The partnership between the state Department of Labor and Workforce Development and the state’s 19 community colleges has three major components — expansion of the New Jersey Career Connection initiative; identify, expand and build “career pathways” at community colleges; and partner with employers to ensure that education and training are in sync with the needs of the business community. WASHINGTON — Community colleges will play an important role in advancing President Donald Trump’s workforce agenda, Education Secretary Betsy DeVos said at a meeting of community college leaders Thursday. It was DeVos’ first appearance at a conference event in her new role. She noted that the identity and scope of community colleges align well with President Trump’s 100-day plan, which emphasizes job creation. Expanding technical and vocational education, as well as making education more affordable, are critical elements of workforce development, DeVos said. The secretary said she was aware of community colleges’ legislative priorities, and would work with community college leaders during the reauthorization of the Perkins Act and Higher Education Act. In terms of specific policy initiatives, DeVos singled out early college programs, which allow high school students to obtain college credits, for praise. She also gave a nod to increased Pell Grant flexibility. Community college leaders have long advocated for the restoration of the year-round Pell Grant, which would benefit students by allowing them to continue their education during the summer. Many community college students attend school part time, so advocates of the year-round Pell argue that it would allow students to complete their education more quickly. In contrast to the furor that surrounded some of DeVos’ other recent public appearances, the crowd at the ACCT summit sent her off with a standing ovation. DeVos kept her remarks short, speaking no more than 10 minutes. 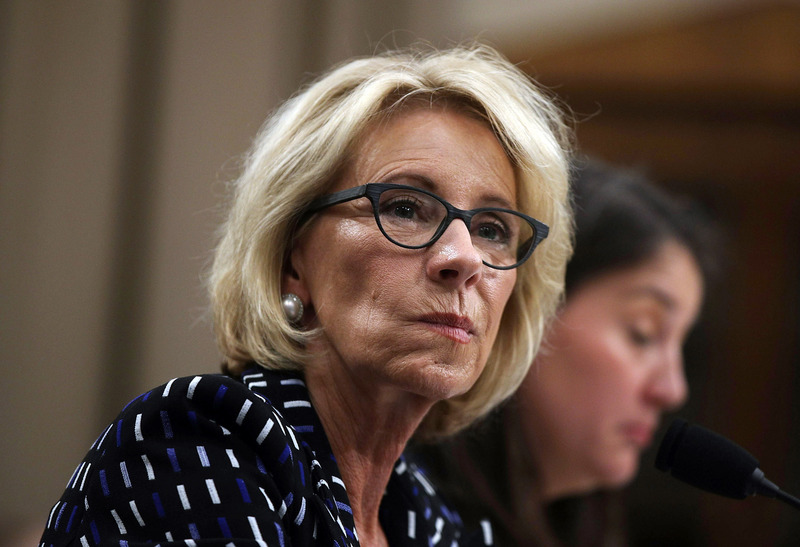 She did not accept questions from conference attendees or reporters, but did allude to some of the controversy that threatened to engulf her confirmation as education secretary. DeVos’ initial confirmation hearing precipitated several weeks of wrangling in the Senate. The final vote to confirm her as secretary came down to a historic 50-50 tie when two Republican senators broke party ranks to vote against her. The tie had to be broken by a vote from Vice President Mike Pence, the first time a vice president has had to make the final call on a Cabinet secretary’s confirmation. David Baime, senior vice president for government relations and policy analysis for the American Association of Community Colleges (AACC), said that DeVos’ address was encouraging. “She didn’t spend a lot of time delving into policy details and we knew that was going to be the case, because she’s so fresh there, but I think people were really pretty excited by her remarks,” he said. Baime said that community colleges hope to be a part of any potential infrastructure initiatives that the Trump administration might put forward. They are often the training ground for workers in vocational fields, such as construction or IT, which would be crucial in any major works campaign. In addition, community colleges themselves could use an infrastructure boost, Baime said. “Our facilities in many places are in need of a lot of deferred maintenance and could really use outside capital that the states just are not in the position to provide in many areas,” he said. Responding to DeVos’ emphasis on early college programs, Baime noted that most such programs are state initiatives. As a result, they do not fall under the purview of the federal government, although they are supported by federal investments in K-12 education, the Perkins Act, and Title IV funding. Pursuing higher education is an expensive endeavor. In an increasingly competitive world it is perceived that a four-year college degree is vital to succeed. These perceptions in part fueled the acquisition of now sky-high student loan debt. Yet the pragmatic among us see that neither attending college nor refusing to seems to result in a winning hand. Refuse to attend and you’ll struggle to find work; Get your degree and you’ll slog through a mountain of debt. It’s the classic conundrum: damned if you do, damned if you don’t. I propose that there are alternatives to this terrifying situation. What if you could get a four-year degree from a reputable and regionally accredited university for half the total cost of what you might ordinarily pay? Attending Community College first is the key. It’s understandable that many people see college education as unattainable. Shortly after High School I went to college and later left because I couldn’t afford to stay. The dreaded Expected Family Contribution (EFC) was my downfall. Despite what the EFC claimed my parents were ‘expected’ to pay, they could not afford to contribute thousands upon thousands to my education. These estimates go off of raw numbers and don’t take into account living expenses, medical debt, or any other financial obligations. My parents absolutely could not help pay for my education. I lived away from home and had a job making little more than minimum wage. I didn’t get anywhere close to the maximum payout from the Pell Grant because of that Expected Family Contribution. When my dad was young, working a summer job could generate the money necessary to put him through a semester or two of school. Definitely not the case when I attended in 2009. College is expensive, more so now than ever before. Just take a peek at the tuition inflation rate and you’ll see what I mean. The only option I saw at the time was getting a loan and I wasn’t enthusiastic about taking on massive debt. Millions of bright, would-be students and degree earners are stuck between a rock and a hard place. When the maximum Pell Grant payout is only $5,775 per YEAR and most universities charge between $400 – $600 per credit, the Pell Grant just isn’t going to cover it for a typical 30 credit full-time year. This is a common dilemma for students across North America. Canada recently eliminated their own education and textbook tax credit system, making it more difficult for students looking to off-set the cost of education. That change became effective on January 1, 2017. At 24-years-old you’re finally free from Expected Family Contributions (EFC) and viewed as an independent student. It’s worth noting that it’s possible to become an independent student before this, but requires extensive documentation (letters, financial documents, statements) to prove that your parents have no part in supporting you. When you’re finally considered independent it’s completely possible (depending on your income) to get the maximum payout from the Pell Grant. Fun fact for you: whichever college you complete your coursework at is the one who will give you that coveted Bachelor’s degree to hang on your wall. The reputation Community College gets is undeserved, and can offer great local learning opportunities for your first two years of college. It doesn’t matter if half the credits originally came from a two-year community college, as long as you finish your studies at a four-year university. One of my own local colleges offers credits to state residents at $136 apiece. That sounds a lot more reasonable than $400 – $600, and surprisingly…you can attend college for an entire year (30 credits) with just that $5,775 Pell Grant AND have enough leftover to pay for books. This cost-cutting tactic combined with personal financial planning can make paying for college much easier. At this point I’m sure you’re wondering…well what if the college I transfer to doesn’t accept all of my credits? Well, the short answer is that most community colleges have articulation agreements with other regional schools to accept the entirety of your Associate’s degree (or X amount of credits). You just knocked two years off your Bachelor’s at a quarter of the price it would cost you at that big shiny University. Finish up your last two years there, and guess where your Bachelor’s degree will be from? This is called achieving the 2+2. Two years spent on your Associate’s, two years on your Bachelor’s. If you really want to get sneaky, look at the graduation requirements for your intended four-year school. Perhaps you can take more community college courses post-Associate’s completion and then transfer those to the four-year Bachelor’s program. Depending on the University, you can always get credit-by-examination via CLEP or DSST. Many of these exams run about $110 apiece and net you between 1 to 6 credits, depending on the subject. Each of these unconventional methods will ultimately save you money and prevent acquiring crippling debt along the way. If the overinflated education bubble isn’t going to make things easy on you, then why not give yourself an advantage by doing things unconventionally? The less of your tuition that comes out of pocket, the better. There’s no single path toward degree completion. Using Community College to complete your first two years of school will significantly lower your total cost and potential loan burden, no matter if you’re 18 or 28. It was one of the most contentious local political issues in recent memory. The push to establish a traditional community college in the region came to a head in 2010, when Erie County Council, the Erie School Board and the Corry School Board all rejected sponsorship of the school. All three entities cited cost concerns at a time when much of the public opposed the plan. While community college supporters argued that such a school would help Erie build a skilled workforce and provide a more affordable educational option for many local residents than the region’s four-year colleges and for-profit trade schools, opponents saw the school as unnecessary when local colleges and trade schools provide similar curricula. Six years later, though, an infusion of cash – and a political climate shift within Erie County government – has resuscitated the community college discussion. County Council on Dec. 13 is expected to sign off on allocating $60,000 toward a feasibility study for a community college in the Erie area. The nonprofit Empower Erie, led by Erie lawyer Ron DiNicola, will use the money to hire a consulting firm familiar with the framework of community colleges to conduct the study. That analysis is expected to examine possible locations for the school; staffing requirements; community needs; accreditation; funding sources, and other factors. County government’s contribution would supplement $300,000 given by the Erie Community Foundation, the Erie County Gaming Revenue Authority and the Susan Hirt Hagen Fund for Transformational Philanthropy. If County Council eventually votes in favor of creating the college, as well as county sponsorship of the school, the Hagen Fund, foundation and ECGRA have promised an additional $3.7 million in support. Community college students often include men and women who did not go on to college immediately after high school; displaced workers looking to be retrained for a new occupation; and college-educated adults who want to further their education to help advance their careers. DiNicola said that there remains “compelling” evidence in favor of establishing a community college. He noted that none of the state’s 14 community colleges is located near Erie; the region continues to see high poverty rates; the area is still suffering from the loss of manufacturing jobs at places like GE Transportation; and access to affordable postsecondary education remains an issue for many students with limited financial means. According to a recent report by Research for Action, a Philadelphia-based nonprofit education research organization, Pennsylvania has the lowest rate of community colleges per capita in the U.S. Further, Erie County is one of the largest areas in the state without direct access to a community college, DiNicola said. Unlike 2010, there appears to be majority support on County Council for launching a community college. Four of the panel’s seven members – Chairman Andre Horton, Councilwoman Kathy Fatica and Councilmen Jay Breneman and Fiore Leone – have told the Erie Times-News they plan to support the community college study on Dec. 13. All support the notion of establishing a new school as well. “I admire all the work all of those (colleges and trade schools) have done to provide affordable, accessible, quality education,” said Horton, a strong supporter of the Empower Erie effort. “But I do believe there’s still room in that space for a community college. I believe there is a vast amount of need not being met, particularly in the urban core, in terms of meeting employers’ needs and preparing people for the workforce. According to the College Board, the average cost of tuition and fees nationwide for the 2015-2016 academic year was $32,405 at private colleges, $9,410 for state residents at public colleges, and $23,893 for out-of-state residents attending public universities. By contrast, average tuition and fees at a community college was $3,131, and many students receive financial aid that covers most or all of that cost, the College Board’s research shows. Erie County Executive Kathy Dahlkemper also supports the study, and would like to see a new community college eventually created in Erie County. However, County Councilwoman Carol Loll said she still opposes establishing a community college – and is likely to vote no on the study – because she feels the school would duplicate what other colleges, universities and trade schools do. “The taxpayers don’t need to pay for something that’s already being offered,” Loll said. Community college costs are typically covered by the school’s local sponsor, through state funding, and student tuition. County Councilman Kyle Foust, a director of internship programs at Mercyhurst University, has indicated he will abstain from voting on the community college study because of concerns that the school would compete with his employer. Foust also abstained from voting on county sponsorship of a community college in 2010. Councilman Edward T. DiMattio Jr. said he might also abstain because he has a relative who works for one of the state’s other community colleges. Since 2014, Edinboro University of Pennsylvania has been among the schools trying to fill the local community college void. At its 26-acre Porreco College campus, 2951 W. 38th St., Edinboro offers two-year associate degrees in applied technology, business administration, criminal justice, human services, liberal studies and preschool education, as well as other programs. Porreco College’s enrollment for the fall semester is 381 students, up from 320 students in the fall of 2015, Edinboro spokesman Jeffrey Hileman said. Tuition and fees for full-time students are $4,347 annually, but Erie County residents are eligible for endowment funding of up to $1,500, which lowers the total to $2,847, Hileman said. Hileman said that Edinboro “is neutral on the plan to conduct a new feasibility study” for a community college. However, Hileman said that if a new Erie County community college is established, “it is likely that the relationship between the university and a community college would be complementary rather than competitive. Porreco College was created, and continues to develop, to fill the community college void in Erie County. That’s one of many ways that Edinboro University strives to fulfill its mission. Local for-profit trade schools such as Fortis Institute and the Great Lakes Institute of Technology also offer a variety of two-year degree programs. In addition, Mercyhurst has offered freshman-level courses at Erie’s Booker T. Washington Center at low or no cost to inner-city students, and the school’s North East campus has provided a curriculum similar to community college offerings since 1991. DiNicola said that as the community college study progresses, Empower Erie hopes to bring all local postsecondary schools into the discussion. Horton added that supporters of the plan have discussed community college issues with officials in Harrisburg and they are confident that the state Board of Education – which must sign off on a new community college – supports Empower Erie’s efforts. “We believe they’re sympathetic to our plight,” Horton said. Leone, County Council’s longest-tenured member, voted against county sponsorship of a community college in 2010, concerned that the county could be held financially responsible for millions of dollars each year in community college operating costs. He has a different take now. SUNBURY – The state Department of Education met with local leaders about bringing a community college to The Valley. Dr. Wil Del Pilar, deputy secretary of post-secondary and higher education met with members of the Susquehanna Valley Community Education Project (SVCEP) Monday. Community education classes are already being offered at the Shikellamy High School. You can find more information at www.newcommunitycollege.org. We had two wonderful weather days at the Sunbury River Festival that were fantastic! We shared 30 community education courses handouts and conducted two interviews. We networked with many who were excited about the prospect of having a regional community college. A picture of our booth is attached – thanks to Sunbury Revitalization we had a prime spot under a shady tree. A special shout of thanks to Tom Rall, Kevin Singer, Dave Zartman, Rick Shoch, Scott Myers, Barb Spaventa, and Rodger Babnew for staffing the SVCEP booth and to Carole Mazzeo for scheduling. Since 2006, the number of people completing certificates – a credential that typically requires less time to finish than a two-year degree – has risen substantially at many schools. We crossed a milestone this year – offering three community education classes! New students came because they heard about it on radio, rack cards, conversations, and school site visits across the region. Navigating the Route to College – High school students and parents – this is your guide through the jungle of post-secondary options and application processes. Job Hunting and Getting Hired – Need a job and looking for work? This is the course for your pathway to employment. Statistics for Dummies – Demystify statistics. Learn how and why these tools are used to make decisions. We kicked off the New Community College Campaign in January to raise $80,000 to begin the certificate programs – the second stage in the roll out of a new community college. You can contribute to the creation of a new community college in our Susquehanna Valley by clicking on the link below. Thank you for being a part of this extraordinary endeavor. Members of the SVCEP Board of Directors and the public gathered at Zartman Construction in Pointe Township to commence the public campaign to raise funds to advance the mission of the SVCEP – Mission Statement:. “To establish a state-approved community college with a culture of transparency and accountability to the community. Our college will be collaborative and innovative, providing high-quality post-secondary education to students in middle Pennsylvania”. (SVCEP Minutes, June 2015). SVCEP is an IRS determined 501(c)3 non-profit organization – Gifts can be made out to Susquehanna Valley Community Education Project (SVCEP) and mailed to Herring, Roll, and Solomon at 41 S 5th St, Sunbury, PA 17801, and donations can be made online. SUNBURY — Northumberland County could be the place for new jobs and initiatives of the upcoming spike in rural job growth expected in the United States — but only if they’re ready. Northumberland County Commissioner Kymberley Best, who attended the Rural Community College Association conference at the White House Wednesday to bring back information for the Susquehanna Valley Community Education Project, wants to be prepared for the future. “We want to be ready for the companies returning to the country,” she said. The local community college initiative, set to offer three non-credit courses in the spring, could be the catalyst to train these workers who need these jobs. According to information provided at the conference, Best said it is now more profitable for companies to return to the United States, partly because of cultural differences and instability of certain countries. Salary.com recently reported that 37 percent of manufacturing executives are planning or giving serious consideration to returning from overseas — often called “reshoring” or “insourcing” — including General Electric and Master Lock. “Labor costs in China are rising quickly — up to 10 percent in the last year alone, by some accounts,” according to Salary.com. As many as 3 million jobs could be added to the U.S. job market by the end of the decade, according to Salary. com. Best also said that studies, according to information from the conference, show that people from rural areas are wired to think differently that those who sit behind computers. They are expected to the backbone of this job reshoring. Furthermore, Best also described a tax incentive program for private businesses who want to partner with local community colleges to develop specific courses to train students for company specific jobs. She said it’s likely that Weis Markets or Furmano’ s could benefit from this. Northumberland County Commissioner Sam Schiccatano, a retired educator, supports such an initiative. “It’s not about extra education, it’s about picking and bringing the right education into the community,” he said. Best said the conference was beneficial for the local project. “I learned a great deal about the need, design and fit for rural counties,” Best said. The Susquehanna Valley Community Education Project Board is will begin offering mini courses at the Shikellamy High School in March, including Navigating the Route to College, Job Hunting & Getting Hired and Statistics for Dummies. The goal is to have 25 students enrolled; as of now, there are 17. The next step is to raise $80,000 to hire the first president and to apply to be a licensed school, which will allow the purchase of licensed curriculum. The road to accreditation is likely to take five years, Best said. For more information on the community college initiative, the January fundraising launch, or the upcoming courses, call 570.898.4334 or go online to: newcommunitycollege.org. Go to the link below to read the article by Ali Stevens. Grateful Appreciation to Weis Markets for the generous contribution of delicious food trays provided for the Kick-Off event! NORTHUMBERLAND — The Susquehanna Valley Community Education Project will launch its fundraising efforts on Thursday, January 28, at a 5:30 p.m. reception at Zartman Construction, 3000 Point Township Drive. $80,000 to cover expenses as the board and volunteers move forward on bringing a community college to the Susquehanna Valley. of establishing the community college. Bob Garrett, president and CEO of the Greater Susquehanna Valley Chamber of Commerce, will talk about the positive economic impact when educational opportunities are enhanced. college efforts by attending this event. Route to College, Job Hunting & Getting Hired and Statistics for Dummies. For more information on the community college initiative, the January fundraising launch, or the upcoming courses, call 570.898.4334 or go to www.newcommunitycollege. The traditional four-year college experience isn’t for everyone. Some students aren’t sure what they want to study, while others are looking for a more affordable education. Community colleges can be good options for students in these situations.If you’re considering community college, or are just curious about the benefits, check out the following reasons why attending one might be a good decision. Paying for college is a big consideration, and annual tuition and fees at four-year institutions can soar to tens of thousands of dollars. This can also lead to mounds of student loan borrowing and debt.In contrast, many community colleges charge around $1,000 for in-state tuition. Attending a community college can be a good way for students to ease into the world of higher education and learn at their own pace.This is especially true for students who struggled in high school or anyone who’s unsure if they want to make the significant time and money investment in college, experts say. Financial aid isn’t only for four-year college students – community college students are eligible as well. Federal student loans require students to be enrolled half time – about six credit hours, or two courses. Students just need to make sure they don’t drop out of classes or they’ll risk losing their aid award. About 60 percent of community college students attend school part time, so anyone interested in taking one or two classes at a time will not feel out of place. This makes community college a good option for nontraditional students like parents and older students who wish to balance school with family or career obligations. Community colleges have associate degree programs in science, technology, engineering and mathematics. These so-called STEM subjects are in demand by employers, and some community colleges are supporting these students as they work their way up to a career, experts say. Enrolling in a community college doesn’t have to be a student’s final destination. Many two-year schools offer admissions agreements with public colleges that allow qualified students to transfer their credits toward earning a bachelor’s degree. Two-year colleges haven’t always provided the same student experience as four-year schools, but that is changing. Nearly one-quarter of community colleges now offer dorms, according to the American Association of Community Colleges. And it’s possible to find extracurricular activities, scholarships and networking activities on two-year campuses. Many community colleges offer smaller class sizes than larger schools, meaning students can find more personal attention and one-on-one time with instructors. This can be a plus for students who like to learn at their own pace and ask plenty of questions as they go. Career progress is often tied to advanced degrees and skill development, usually through costly graduate school programs. But community colleges provide professional and short-term certificates in many fields, including information technology and electronics. As is the case with four-year universities, certain community colleges have expanded online offerings to entice more students. This includes training professors to be available at odd hours, and tailoring programs to fit regional industry needs. These credits can potentially be used toward a four-year degree. Dr. James Blankenship was interviewed by Mark Lawrence on WKOK about efforts to start a new community college in our valley. He talks about the new classes–vocational and credit– beginning next fall in Sunbury. Dr. Blankenship discusses the dynamic, new board that is launching the complex process of becoming a state-approved community college, as well as how people can get involved to help. Dr. Blankenship is Director of Cardiology at Geisinger Medical Center and is one of the driving forces behind this project. Go to wkok.com to hear the recorded interview. Obama Supports Community Colleges in State of the Union Address In his State of the Union Address on January 27th, President Obama called for the investment in jobs, skills, and education by urging the Senate to pass a bill that supports Community Colleges, stating Community Colleges are a “career pathway” to many. President Obama also expressed his wishes to renew the Elementary and Secondary Education Act to focus on college access and affordability through the increase of Pell grants and tax credits. “… I urge the Senate to follow the House and pass a bill that will revitalize our community colleges, which are a career pathway to the children of so many working families. View his quotes regarding Community Colleges and to read more click here. YOU are an important voice in this ambitious and exciting project. YOUR participation in this pioneering endeavor is urgent so please browse this site, contribute your comments, questions, concerns through Video Forum and SVCC Talk and send the Petition Letter to your county commissioners. OUR cumulative efforts as the residents and voters of Montour, Northumberland, Snyder and Union counties will build the bridge to our regional emergence and prosperity through the creation of our Susquehanna Valley Community College. AdvancePA: Community Colleges Leading the Way! This statewide campaign is calling on policymakers and candidates to make expanding opportunities at community colleges an economic priority in Pennsylvania. Community college leaders, students, and community members are voicing their concerns about the role these accessible and affordable education options can, and should play in strengthening the economy and quality of life throughout the state. We thank you for taking the time to learn more about how you can help AdvancePA! Don’t forget to sign the petition!